Delhi, Agra, Calcutta, Hyderabad, Vijayawada, Chiluvuru . . . The sights, sounds, smells, and people are fading in my memory. I am surprised and a little dismayed and disappointed in myself that I so quickly settled back into “normal” living. A popular country song when I was a teenager had a line, “Stop the world and let me off.” There were times since January when I wished I could slip away for a month and just reflect. Reflect on who I am, who I am in relation to what God is doing in the world, and why I should be bothered with a remote village in Andhra Pradesh. Are there not a hundred and one local projects worthy of our time and energy? These doubts and questions are short lived as soon as I reflect on the nature of God. We bother because God bothers. We bother because we were there and met brothers and sisters in the Lord. We also met many potential brothers and sisters. We bother because we serve a God who cares. We serve a compassionate, caring God who, “like a shepherd feeding His flock, gathering the lambs in His arms, holding them against His breast” (Is 40:11). We bother because not only are we precious lambs gathered in God’s arms but every citizen of Chiluvuru is also one of His lambs. God’s love is such a powerful companion for us, that hope, courage, and direction for our lives result. To know God’s love is to live in His will for us. God’s will is not some label that can be put on unhappy situations. Instead of declaring anything and everything to be the will of God, we must be willing to ask ourselves where in the midst of our coming and going do we move with God? We bother because God has put Chiluvuru in the path of too many LaGrange County Christians to ignore the obvious. 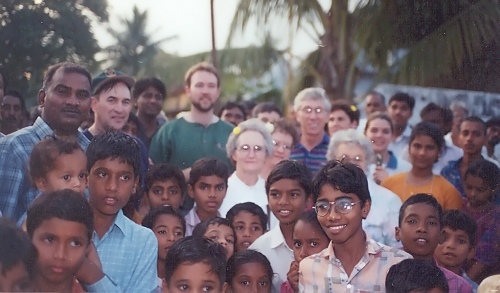 We are compelled by the love of God to share our particle of light with God’s creation in Chiluvuru, India. Harvey Chupp, former pastor and ministry partner with Menno Clinic.